Watched the trailer for The Man From U.N.C.L.E. Henry Cavill should be the next James Bond. That tweet alone, making the 10 month wait for The Man From U.N.C.L.E. an excruciating one. Aaron is a writer attending the Australian International Movie Convention, and he just got to watch Solo in action. @HenryCavillNews It was more of a teaser. Showing Henry & Arnie trying to work together as a team. Aaron also shared some details on the scene he watched. They may be considered spoilery, so you can read them HERE. A few months ago, Spain also got a preview of the film. Hopefully we don't have to wait too much longer, before getting our first look at Henry as the American spy on the big screen. The Man From U.N.C.L.E. is set to be released August 14, 2015. It would be a dream come true if Henry would be the next James Bond. 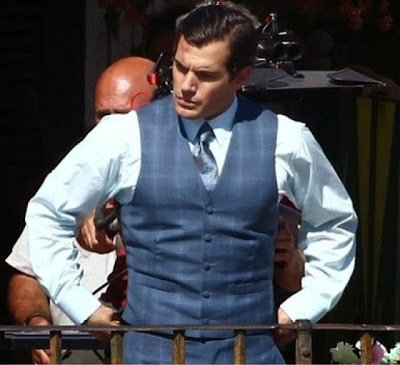 He would be perfect for that part just as I am sure he is perfect for Napoleon Solo. Will he be using an American accent for Napoleon Solo? Another good reason for him to be James Bond, we could hear him with his native British accent for once again.